The same day I found culver’s root while scrambling about on rocks, I found this plant. It, too, was climbing over rocks. It’s a vine, liking rocky habitats and sunlight. Though I found several plants, I only found the one flower (and two days later, still only one flower). It grows throughout the eastern US through the Great Plains and the desert southwest, but is endangered in New Jersey and Pennsylvania. 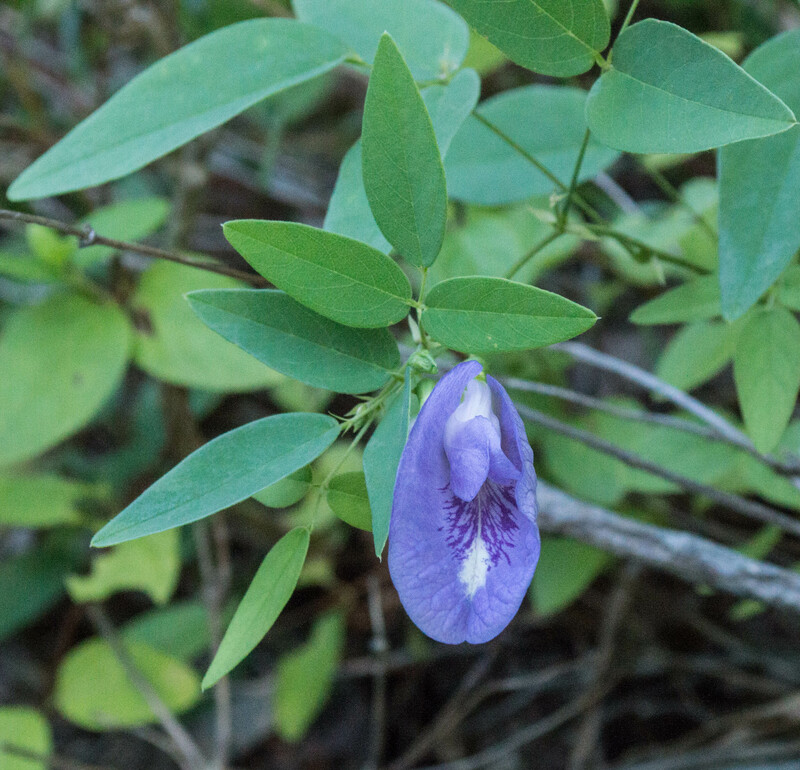 Only one other natives species of Clitoria grows in the US, and that only in Florida. About the genus name… I know what you’re thinking, and you’re right. First described by a German botanist in 1678. I thought maybe “mariana” was his girlfriend, which is dubiously romantic. “Honey, I named a flower after you.” But according to several different sources, the specific epithet “mariana” means “of Maryland”. So you could also call this flower “Maryland lady parts”. As a Maryland native I’m not sure how I feel about that. Apparently over the years botanists have been offended by the genus name and have tried to change it; Wikipedia has a nice little discussion on the topic.. This entry was posted in Uncategorized and tagged Atlantic pigeonwings, butterly pea, native plants, pea family, wildflowers by elizabeth. Bookmark the permalink.